I have been accused of being rude, please read through and make your own decision, I have attached the booking form to show the hefty discount I was offering for two persons only. I have redacted any means of identifying the writers of the review. These Guests phoned in July to book a house in August for two people, and I told them I only had the Eco-Loft available which slept only 2 persons in one bedroom and Apartment 6 which slept up to 4 but that I would offer a low-occupancy discount based on two people, they asked could they view them on the internet and I gave the appropriate details. They came back a day or so later saying they would prefer a house that opened directly onto a garden as opposed to a balcony in the case of number 6, and that there might be more people staying. I suggested I had house number 2 available but that it was a large house capable of sleeping 6 people so would cost more but that I would still offer a low occupancy discount and that they could pay for any additional guests on a nightly price of £20 per person. They send me a text saying their budget was limited to £360 and I replied by text that I would offer House 2 at £320 for two people and that they could pay for any additional guests at £20 per night. They replied ‘Thanks, that’s great’ and said they wished to book. 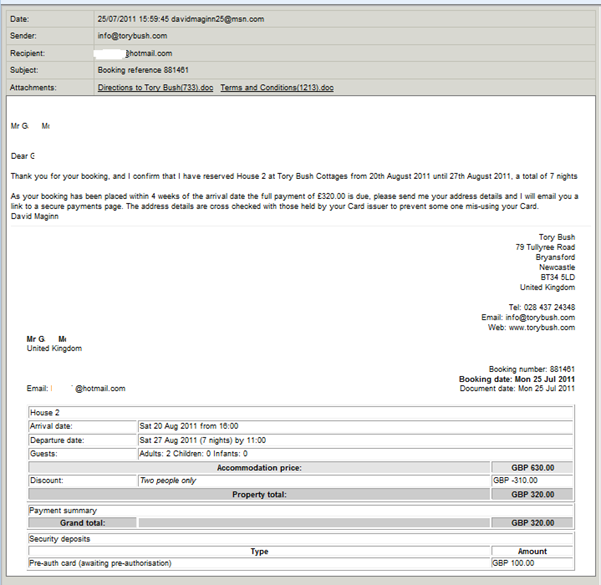 I drew up the booking form below, which shows the full price of the house at £630 but with a ‘low occupancy discount’ of £310, (they were getting the house for basically half price) and emailed it to them on the 25/7/11, and asking for their address details to initiate payment. I replied that I would resend the email the next day as I was out of the office. 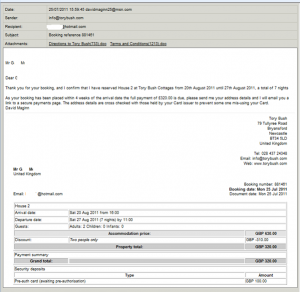 I also sent a text on the 3/8/11 asking again for their address details as it would not be possible to pay online as the Card used is checked against the address details. I never got these details, instead I got a call a night or two later on my mobile phone from the husband of the couple, saying they were only going to pay the £320 and did not see why they had to pay the extra to have people come down and stay. I said ‘ G… lets cancel the booking and that I am sure that you can find cheaper accommodation somewhere else.’ At that point the mobile phone signal broke-off, I expected the couple to phone back but they did not. Coincidentally the fact that they phoned on the mobile is significant, not only from the point of view that signal failed which may appear as I rudely ‘hung up’, but to make the mobile phone work in my office I have to leave it in a window and put it on speaker phone when someone calls and not move the phone. As a consequence of this I have a witness to the conversation with G. M. and they were quite shocked by the manner in which I was addressed.